A blank T-shirt is like a blank canvas. Put words and images on a Tee and it becomes part of your identity. It’s how you share a joke with mates, challenge the establishment, express your beliefs, push a brand or support a band. Maybe it’s the way you show some love for whānau and friends or some pride for your neighbourhood and NZ. Wear the T-shirt and your story is out there. 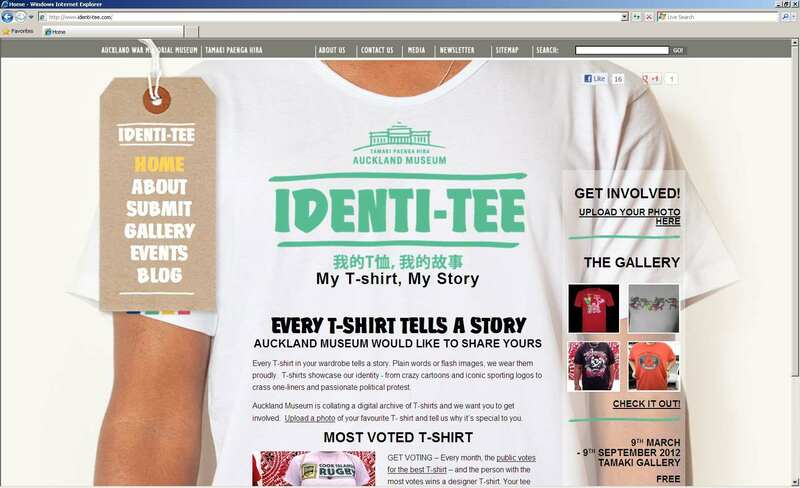 Auckland Museum is gathering the largest digital collection of T-shirts, with the help of the whole community. Identi-Tee website - you can load up images of your own Tee's to the museum's Photo Gallery. In a first for the museum, the digital crowd-sourcing project is running alongside an exhibition by the same name. Identi-Tee: Taku Tihate, Taku Korero (My T-shirt, My Story) opens in the Tamaki Gallery this weekend. To seed the digital project, Auckland Museum gathered stories at the Ngapuhi Festival earlier this year, Pasifika and Polyfest and from its own staff. Identi-Tee co-curator Chanel Clarke, Curator Maori at the museum, says gathering these early t-shirt stories has confirmed the results of the exhibition team’s initial research. Exhibition developer Janneen Love says inside the exhibition photos of t-shirt-clad New Zealanders, taken by respected photographer Gill Hanly, provide an interesting lens on our past. The exhibition also includes t-shirts from the museum’s collections and a film from visual artist Janet Lilo exploring the connections between t-shirts and identity. People will be invited to share their t-shirt stories onsite in the gallery and Te Kakano Information Centre and online. The growing digital collection will also appear in the exhibition. Click here for more information on the Identi-Tee project or to add your t-shirt story. This entry was posted in Auckland, Exhibitions, Local events and tagged Auckland Museum, Identi-Tee, t-shirt, t-shirts, tee-shirt. Bookmark the permalink.